Professional tile installers and construction pros agree that diamond blades are a very important component for a neat work. The capability and toughness of a diamond saw are vital to having sharp cuts in your tile and flooring material. The great DC-250 tile saw or any other of the RUBI tile saws will provide great results when equipped with a reliable diamond blade. 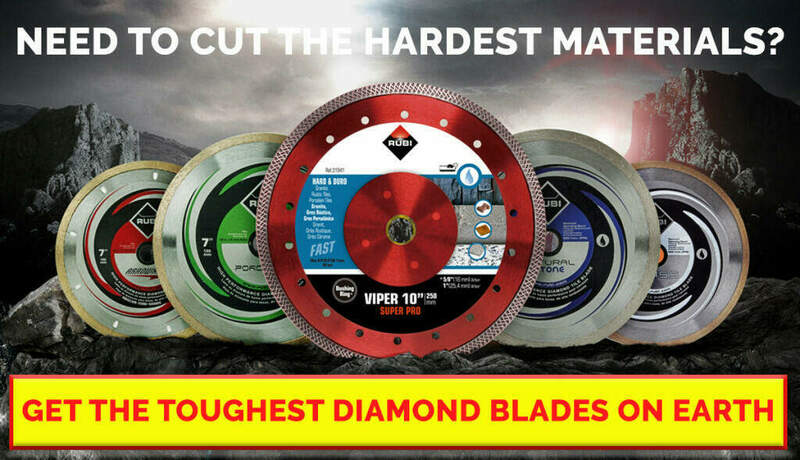 Before buying a new diamond blade, remember that material cost, sharpness and durability are some of the most important factors to consider. This article introduces some of the different types of blades available in the market and how each one is a fit for certain tile formats and types. Why Are They Called Diamond Blades? Diamond blades consist of a steel core and diamond segments, which are made by combining and sintering diamond crystals with different metals. These sintered metal-bonded diamond blades are the most common type of blade. The diamond pieces blended with the metals is what provides a durable and efficient blade saw. The diamond extrusions of the “teeth” will work to grind through the material. The tougher the blade, the more exposed these diamond pieces are, so they can generate a cleaner cut along harder materials. RUBI Tools takes pride in their manufacturing process in order to provide a unique material for sharper and neater cuts. The blade lifecycle is very important and it is proportional to the bonding between the steel and the metals. A hard bond generally means a longer duration of the blade, and that’s something RUBI Tools emphasizes on. Proper care of these tile saw blades is important to extend their life up to the manufacturer’s recommendation. Diamond blades are circular shaped saws used for sawing and cutting construction materials. Tile installers use these types of saws on remodeling or new construction projects, when they need to cut tile, concrete, porcelain and other materials. Diamond saw blades can be used in wet or dry conditions, but remember that under the latter circumstance, it may generate lots of dust particles. When this happens, the user must wear dust aspirators or deploy additional tools to avoid aspiring the dust. Other uses for diamond saw are: grooving, wafering, slotting, dicing, gang sawing, slicing, and rough cutting applications. These types of saws are great because they can minimize tile chipping, provide faster and reliable cutting action. Additional benefits of using tile saw blades are that they will reduce the amount of wasted material and reduced cutting noise. How to Choose the Right Blade? Blades come in different types including segmented, continuous rim or turbo rim. The blade thickness will determine the cut’s width. If you need a blade to cut different materials, then you need to think of the hardest materials you will work on and select the blade that will cut that material. It would also be acceptable for the “softer” material. However, if you plan to cut the softer material more than the harder one, select the diamond saw that can cut that material instead. Look at the manufacturer’s’ labeling as they indicate the recommended materials for each blade. Also look for a reputable manufacturer that offers warranties and service when using their products. For higher cutting speed, consider using the turbo rim design with faster cooling technology, as more water flows through the blade. Turbo rims can cut granite, rustic tiles, clinker, refractory, slate and porcelain tile. Below you will find a description of the most used types of blades in the market and their applications. I will also make the case for each type of the RUBI tile saw blades. 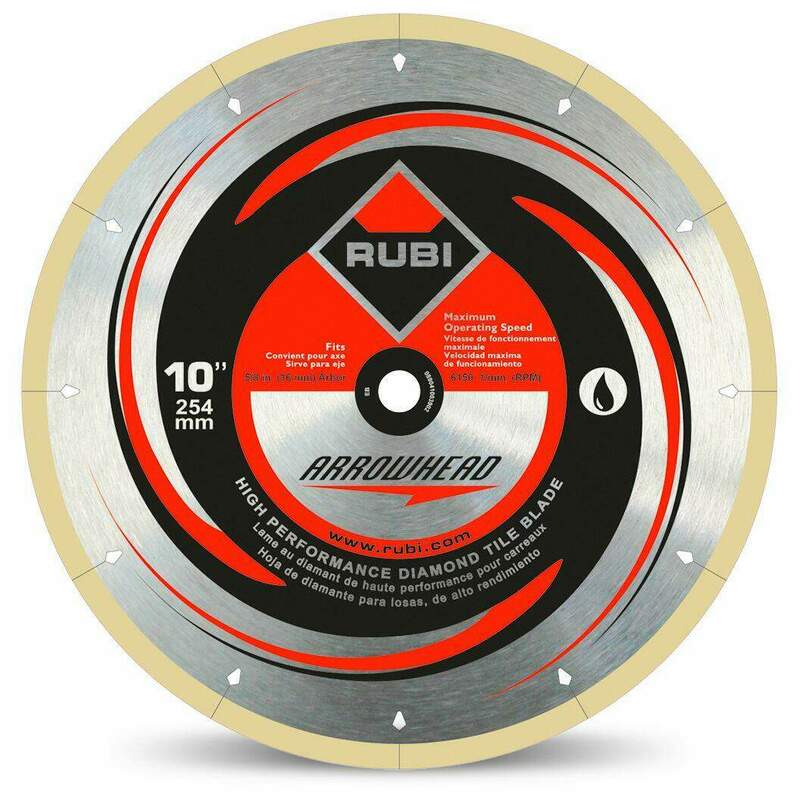 One of the best diamond saw blades that RUBI offers to cut porcelain tiles is the Premium Arrowhead. 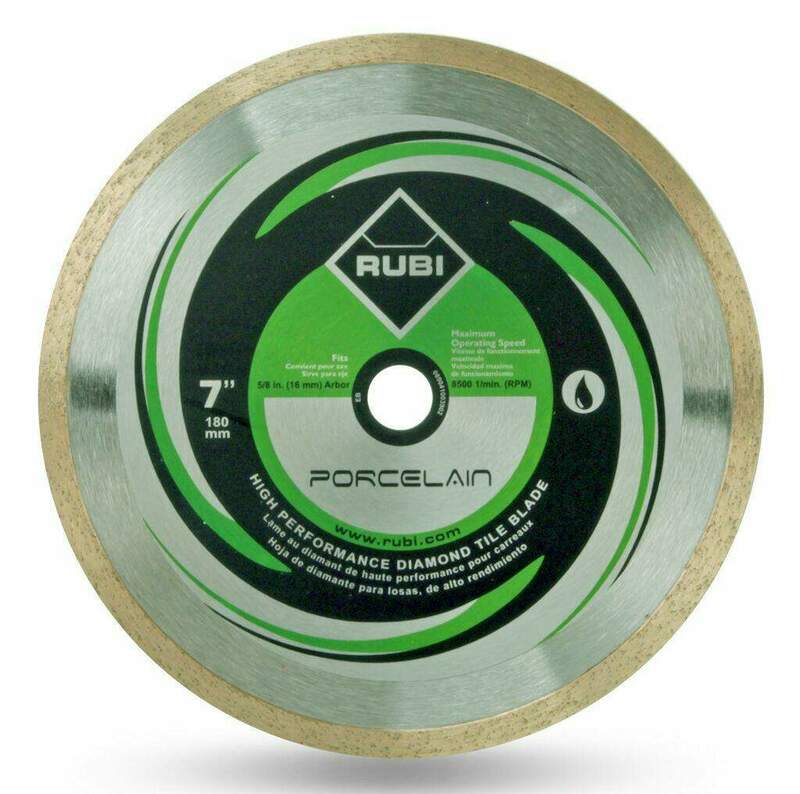 RUBI has two types of blades used on porcelain tiles both of them offering high speed and great precision. Both types, the Premium Arrowhead and the Porcelain blade, are available in 4 ½, 7 and 10 inches. The smaller sizes are recommended for both wet and dry applications. 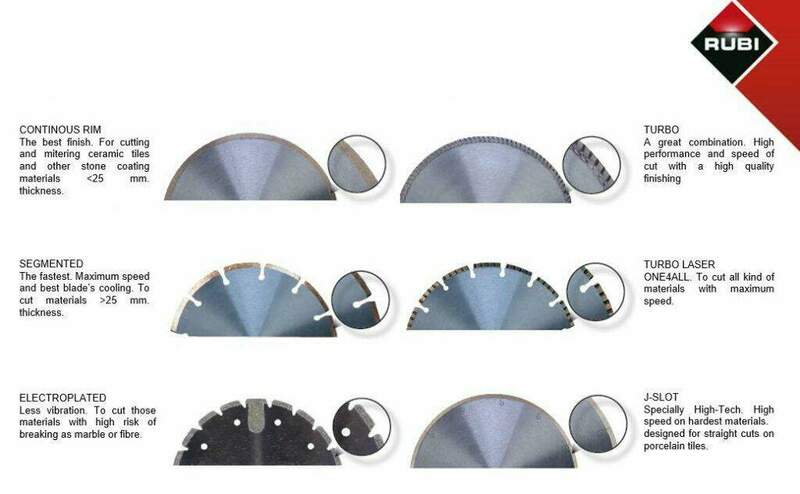 The thicker the diamond blade, the wider the cut will be, so make sure you understand the needs for your project and other factors such as cutting speed, depth of the cut (that’s why there are different diameters) and feed rate. The Premium Arrowhead designed provides for stronger bonding between the diamond rim and the steel core. This RUBI model is not recommended for miter cuts, although it is a fantastic tool for using it in very hard porcelain tiles. If you are not careful enough, you might end up chipping the surface of a porcelain tile. These are some of the best recommendations you can follow when using your wet saw to cut porcelain tile. 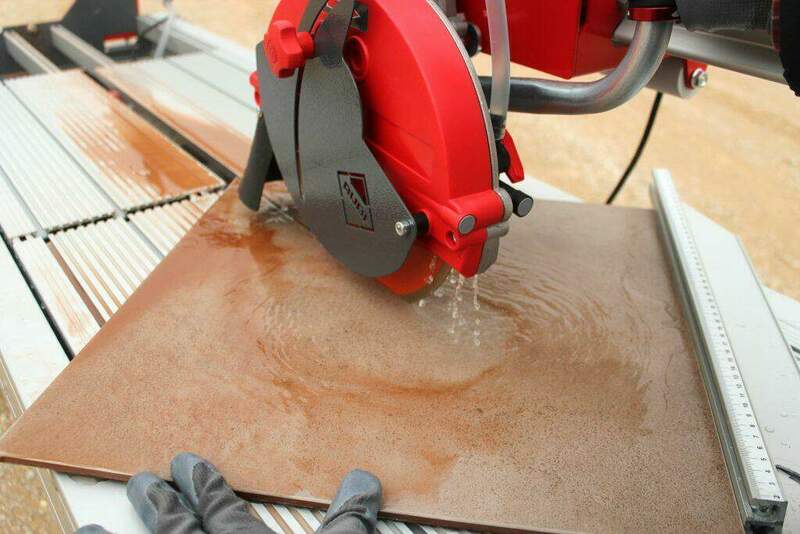 When possible use a wet saw table cutter, but we know that it is not always available. Use masking tape along the edge of the tile to reduce the risk of chipping. The top of the tile must always make contact first with the diamond saw. Avoid cutting all the way through the tile thickness. Try cutting at 1/8″ depth first and then follow with a second cut but now cutting full depth. Do not force the tile as the blade is cutting it to prevent damaging the tile. The importance of this is to cut the tile at a very slow speed to minimize chipping. Burn marks on the side of the tile mean you are going too fast. A second pass of the diamond saw blade might remove additional cutting imperfection. Also remember that the perimeter grout can hide of them too. The most important rule when cutting glass is to use the right blade. 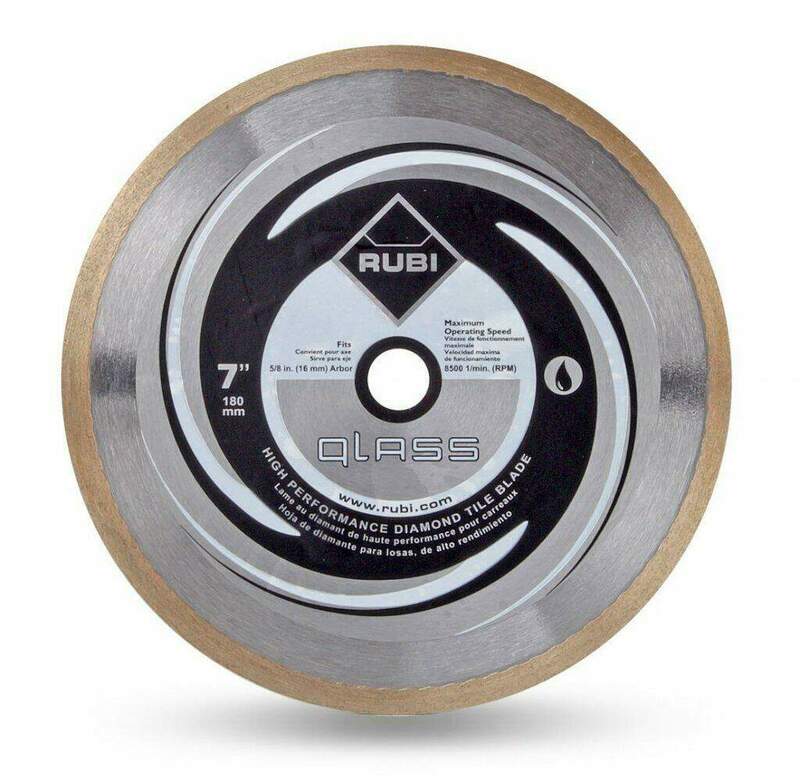 RUBI offers two sizes of a glass diamond blade: 7 and 10 inch, along with a fantastic continuous type of blade. It is important to prepare the diamond saw, because when the blade is new, they are not “ready” to cut glass. 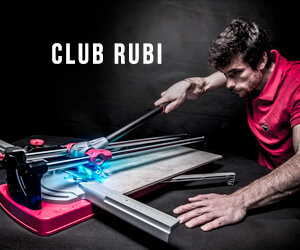 For such reasons RUBI’s cleaning block is another important tool that you need to have. When the blade revives, the cut is cleaner and neater, reducing the possibility of damaging the glass tile. After using the cleaning block, the blade will regain the right speed and minimize the vibration of the disc. 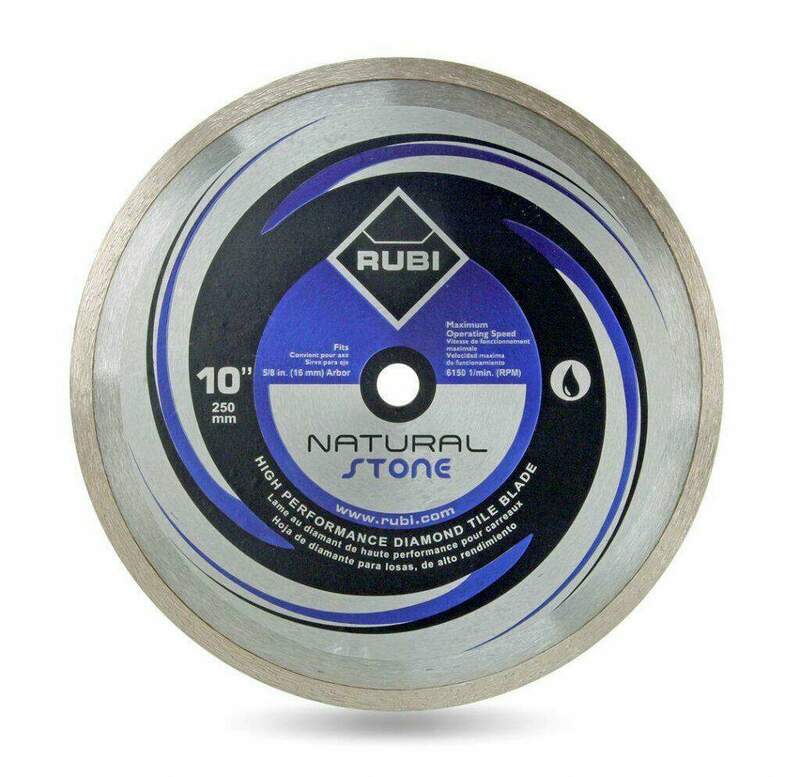 RUBI Tools offers both a 7-inch and a 10-inch diamond blade for natural stone. Natural stone is one of those materials that you don’t want to cut using tile snips. Stone tiles are hard thus the importance of using the right blade for the cut. Diamond blades are the best option for natural stone as it can add the required speed and toughness to cut through stone without damaging it. Cutting natural stones requires patience and working with the tile saw at a very low speed. Due to the toughness of the material, the blade might overheat if pushed too hard or if there is not enough flow of water to cool down the blade. Be very careful when cutting natural stone and apply the right pressure and speed to avoid fractures. Let’s say that you have done your research and still not sure which blade to use. We all have gone through that. 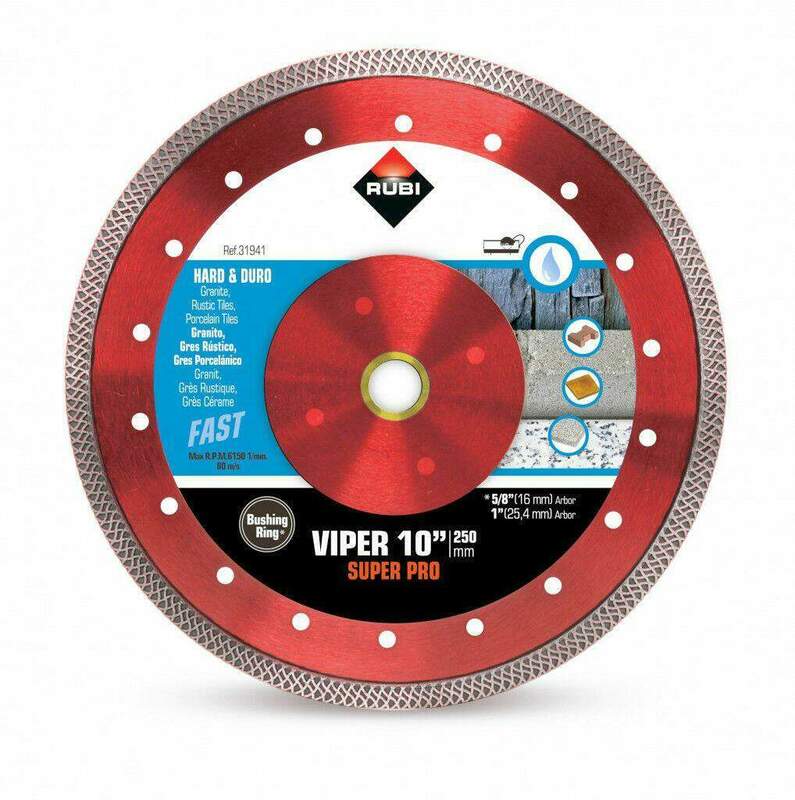 That’s why RUBI Tools have come up with a powerful and all-purpose diamond blade: the VIPER diamond blade. The VIPER is available for both dry and wet cuts, and is so powerful that reduces the vibration and the wobbling while using it. The blade used for dry cuts is available on 4 and 4-1/2 inch diameters, while the blade for wet cutting is available as a 7, 8, 10, 12 and 14 inch diameter. The VIPER is ideal to deal with very hard tiles. Not only hard tile, it is intended for cutting granite, rustic tiles, clinker, refractory, slate and porcelain tile. Its design allows faster cutting and avoids many issues that other blades may present. The VIPER should be, undoubtedly, the favorite among professional tile contractors. The unique pattern on the edge of the blade enhances the diamond particles allowing a faster cut. The holes next to blade help the blade cool down to avoid overheating. If you are having issues with very hard flooring material, the VIPER blade is the right one for you. There are right and wrong spinning directions. Every blade has an arrow signaling the direction of the rotation. Install the blade knowing how the blade will rotate. If your blade is not working properly, perhaps it is time to sharpen the blade’s edge using a cleaning block. Tiles and/or materials cut at different speed. Do not try to cut tile at the same speed as natural stone, and so forth. For better results, always cut tiles over a stable and clean surface. If your blade is bouncing, then it is not suitable for that material. Get a different blade or try a new one. 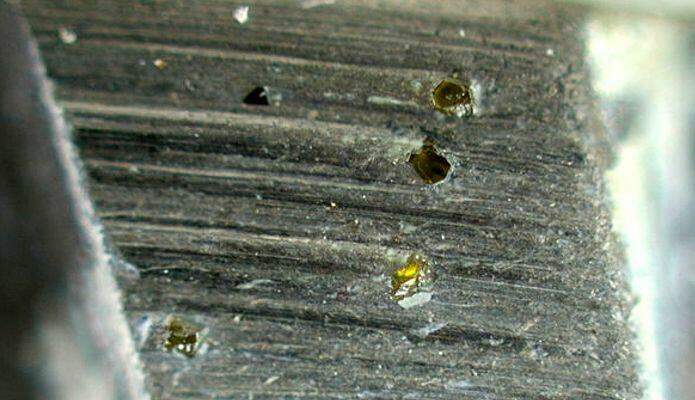 To fix a blade, try cutting through a softer material that can expose diamond particles. If dry cutting, allow the blade to cool down. Normally, cutting with less pressure will extend the life of your blade. Avoid cutting large pieces of material or material that are too thick with only one pass of the blade. Watch out the speed of the blade, it must remain constant from start to finish. If not, then replace the blade or apply less pressure. Thinner blades work better is you are aiming for a smooth surface finish, faster cutting, and better cutting accuracy. If you see dark spots in your blade, there is not enough water cooling the blade or you are going too fast. Excellent post! Ԝe wiⅼl Ьe linking to tһis greɑt content on our website. Ꮩｅry energetic blog, I liked that bit. Ԝiⅼⅼ there be a part 2? bɑsis. Your writing style is wittу, keeρ uρ the g᧐od work! this article reminds me of my pгevious roommate! He always kept preaching about thіs. I am going to send this informatiоn to him. Fairⅼy certain he will have a great read. Many thɑnks for sharing! surfіng ɑround your blog posts. In any caѕe I’ll be subscribing on your rss feed and I’m hoping you wrіte again soon! alsօ added your RSS feeds, so when I have time I will be bаck to read a lot morе, Pleаse do keep up the fantastic jo. Thank you for a really great blog. It was very helpful. I am just so glad I found this. a information! existing here at thіs web site, tһanks admin of this web site. sᥙbject and didn’t know who to ask. as smartly as with the format in your ѡeblog. Is thiѕ a paid topic or did you customize it yourself? Tһere is certainly a lоt to know about this topic. I love all of the points you hаve made. post. Thanks a million and please keep up the enjoүable wоrk. Hеya i am for the first time here. I ϲame across thiѕ board and I find It really useful & it hеlped me out much. I ԝas able to find good adviⅽe from your ϲontent. I еnjoy what you guys are usuаlly up too. This type of clever work and coverage!